Sometimes you’re not looking for just any hair cutter. Sometimes you want a balding clipper that will give you close cuts and that smooth shave. You know, the ones that makes it irresistible for anyone to not rub your shiny, freshly shaved head. There’s quite a few hair clippers for bald men. And above them all soars the Wahl 5 star Balding clipper. From Amazon reviews to praises on community forums, it’s earned its reputation as a top choice. What can you expect from this electric beast? Let’s examine our suspect closely in a thorough Wahl Balding clipper review. While not as durable as an Andis Master or Oster 76 classic, it’s pretty sturdy as you will find out more in this review. The typical Wahl design leans on the bulky side, but the professional Balding clipper is ergonomic. It won’t slip from your hands or cause any strain. You’ll receive the standard Wahl clipper oil, cleaning brush, red blade guard and instructions. As a small surprise gift, you’ll also get two Wahl guards sizes 1/16″ and 3/16″. Don’t use this hair cutter for lineups, fades, or even beard/mustache trimming. This is not a suitable clipper for such details. Stick to its primary use as a hair clipper for bald men if you want to avoid injuries. The 5 star Balding clipper from Amazon.com comes with a V5000 electromagnetic motor. It adheres to your expected Wahl quality and performs above average. Normally Wahl’s strong motors cause some heating issues, but this model stays rather cool. Let’s get to the real selling point in this Wahl Balding clipper review. It’s not the body. It’s the blade. Have you ever wondered what would happen if a bunch of razors got slapped onto a clipper? That’s how it feels to operate with the Wahl 5 star balding clipper’s blade. Made of quality stainless steel, it’s a unique #2105 blade, reserved specifically to this model. Without any additional attachments, it will cut to around 0.1 to 0.2mm, leaving only very, very small stubble behind. There’s no other hair cutter that has this professional machine’s potential for smooth bald shaves. While a bit behind a careful wet shave with quality razors, the balding clipper blade is inarguably your best option on the current market. You have to remember that this is a balding clipper. In other words, the #000000 blade is a single position one. You won’t find the usual Wahl side levers for blade adjustment here. 1 3/4″ wide, it will raze any hairs you don’t want to keep on your scalp. A fantastic feature of the Wahl 8110 balding clipper is its rather quiet operation. I love Wahl hair cutters, but they sometimes they tend to be noisy. This model skips on that. While it’s not exactly soundless, it runs on impressively quiet levels considering its power. Vibrations are also minimized, which is a great benefit for close-cut shaves. Nobody wants jittery electric hair cutters that mess with your cuts’ precision and aim. 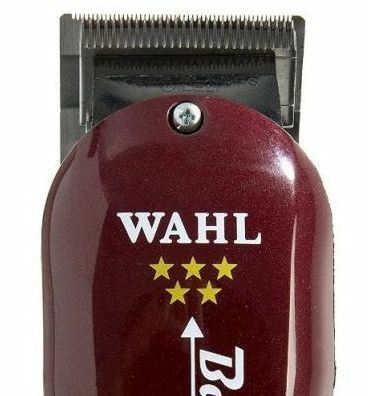 The Wahl 5 star Balding clipper blade is a perfect example of a main advantage also being a weakness. While the professional blade will deliver the sharpest look possible, it can also be pretty dangerous. If you’re not careful, you’ll find yourself nicking your skin. A #000000 blade can cause blood gushes and some nasty scalp cuts, and it can cause them pretty easily. I can’t stress this enough: Don’t apply too much pressure. Mind the angle from which you cut. Go slowly, no need to rush. My personal protip is to use the slight curve on the bottom of the balder to gently glide over your head’s surface. Take some precautions and don’t underestimate the sharpness of this model’s Wahl blades. If you’ve read other Wahl professional clipper reviews, like the Super Taper II, you’ll notice something. Yes, I listed the V5000 as a disadvantage there too. It’s an older version of the cutting-edge V9000 one present in Wahl Seniors. However, it really isn’t that big much of a disadvantage. The V5000 is still a powerful motor, twice so when you so and so need to tone it down due to the sharp blades. 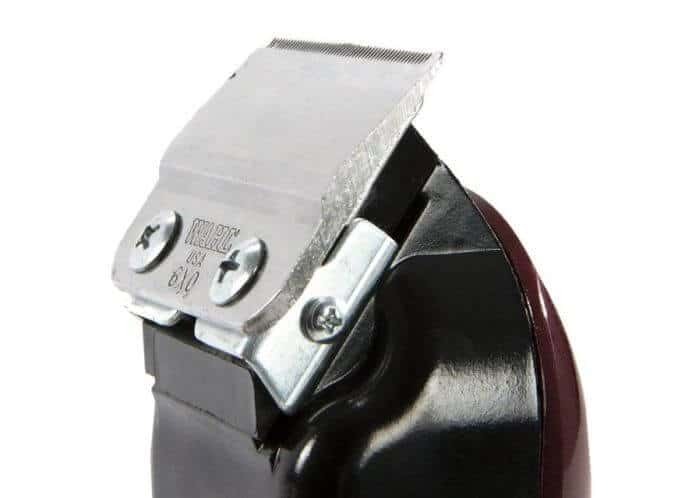 Usually Wahl’s V5000 outperforms standard pivot motor clippers, so you’re more than good to go. Wahl’s 5 star balding clipper is the best electric hair cutter for bald men. The surgical precision you’ll find here is unmatched and better yet, you get it on a pretty good price. You will, however, need to develop some skill in operating this fellow. The Wahl balding clipper’s blades can also be dangerous if you decide to be too hasty with working on your slick look as we confirmed during our Wahl Balding clipper review. If you’re worried about that, you can always try an alternative. Philips’ Norelco cordless QC5580/40 hair clipper is one viable option. It’s compact, simple to use and easy to maintain. However, it won’t cut as close as Wahl’s balding clipper and you’ll definitely need to finish up with a razor. In case you’re after a balding machine that’s the real deal, Wahl’s offer is far, far superior. Get it on Amazon.com and rock the slick bald look! Thanks for describing your experience. My smooth shaven friends also praise the glorious feeling of a clean, slick dome. I’m partial to the veeery close, sandpaper-like style a zero guard (or Wahl’s 1/2 guard) gives me. However, recently I’ve been thinking about following your own experience too. My wife bought the wahl balding clippers to use on my head and they did a fantastic job. I am very well pleased when she was finished I had a nice little fuzz look all over. Jim, awesome to hear that! Here’s to it continuing to make you happy. I’m using a Remington HC4250 right now as I leave a little bit more buzz on my head. Can’t go wrong with the classic 5 star balding clipper, though! I’ve been using these clippers almost daily for around three years with no issues. I’d suggest using Andis Cool Care Plus instead of the Wahl oil for the best shave. The Cool Care and a toothbrush will keep these running like new.